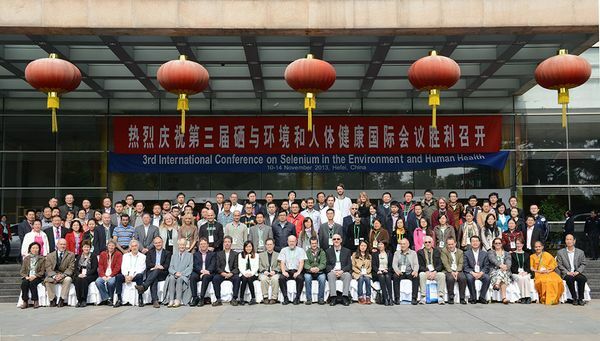 The 3rd International Conference on Selenium in the Environment and Human Health was held on 10-14 November 2013 in Hefei, China. This conference attracted over 100 participants from 19 countries, with about half of them from China. A total of 90 extended abstracts were accepted after peer review, and the conference proceedings entitled “Selenium in the Environment and Human Health” were published by CRC Press. Oral and poster presentations at the conference covered many important fields of selenium research, including biochemical functions of selenium, nutrient requirements, selenium-related health disorders, chemoprevention, biofortification, environmental toxicity, and selenium remediation technologies. During the conference, the International Society for Selenium Research also had its first all member meeting. A special presentation was also given at the conference by the local organizer for the 4th International Conference on Selenium in the Environment and Human Health which will be held in 2015 in Cuiaba, Brazil.